The Trust Performance Message suspension fork is a complete rethink of the suspension fork, with greater riding precision and smoothness than anything else. For our review of the Trust Performance Message Suspension Fork, click HERE. For demo availability, click HERE. If you’re looking at the Message suspension fork, you assuredly have an idea of what this fork offers in regards to improved mid-corner traction, precision handling, and a much smoother ride. 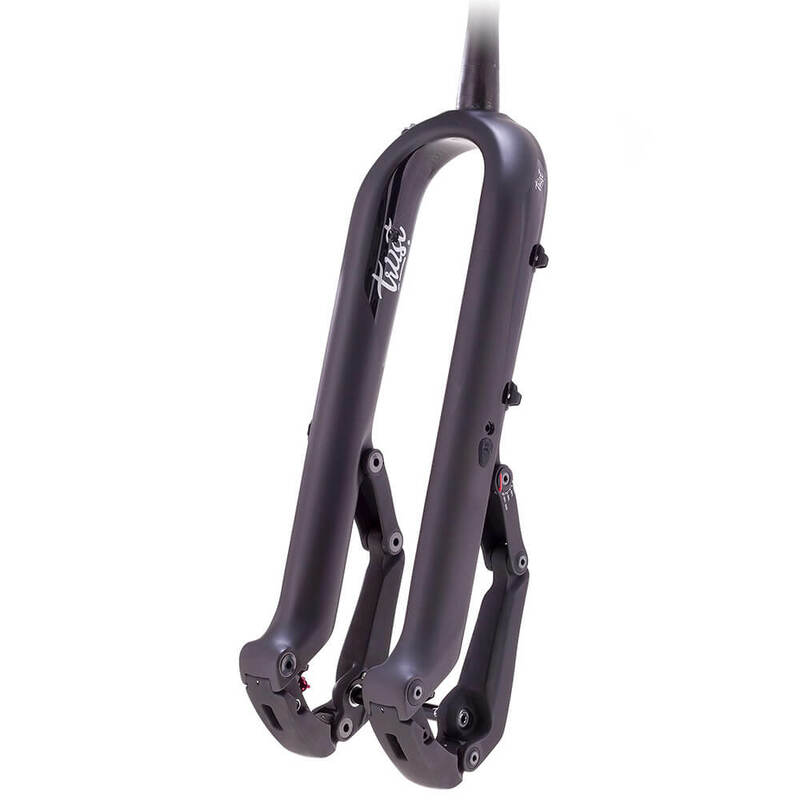 However, if you’re not already familiar, then the Trust Performance Message Suspension Fork is completely different than just about anything else on the market today. Trust Performance believes that the Message is a “mind-blowing reset of what you think a front suspension should do.” The key their claims is a multi-link front suspension design from the mind of Dave Weagle, the mind behind the DW-link, Split Pivot, and Delta linkages found on some of the best mountain bikes in the business. The Message uses a trailing multi-link suspension design, which if you think about it is pretty similar to the basic idea behind a mountain bike’s rear suspension. Like the rear suspension, the geometry of the Message is defined by the pivot locations and linkage lengths, with the goal of allowing the shock to move as freely as possible in reaction to the trail. Trust employs dampers on both sides of the fork housed inside a stiff carbon chassis. With no bushings that can bind under load, the Message is more sensitive to smaller bumps than anything else out there. Using a one-piece carbon chassis instead of two legs joined together by a fork crown and axle means the Message is extremely stiff both laterally and torsionally. Another added benefit of dampers instead of bushings? Service intervals of 250 hours – the length of a year’s worth of constant riding – and five times more than what most other manufacturers claim. Imagine it like moving a full wheelbarrow up and over a curb. It’s easier to swap the wheelbarrow around and place the wheel behind the weight than to try and push the barrow of dirt up and over the curb. That’s how the Message works: the multi-link suspension places the wheel behind where the forces interact, essentially pushing the bike’s front wheel forward and over obstacles. Compare that to a standard suspension fork, which is like pushing a wheelbarrow wheel-first, in that it has to overcome the force acting against it to push it up and over. It’s a much less-efficient and more labor-intensive process, and one that causes uneven amounts of force on the stanchions and bushings of the fork. At 1980 grams, the Message weighs up favorably with a Fox 36 Factory fork. It fits both 29″ and 27.5″+ bikes with 110 – 150 mm travel, and 27.5″ bikes with designed around 130-150 mm travel, meaning it’ll fit everything from a SCOTT Spark to a Santa Cruz Hightower LT. But there’s a very real difference in steering precision and rigidity compared to other heavy duty forks. There’s not a ton of bob when climbing, making the three-position adjust “lockout” switch almost superfluous. Have any questions about the Trust Performance Message, or want to demo the fork yourself? Send us an email any time to info@contenderbicycles.com or give us a call during business hours.